Donald Trump does not like the Iran nuclear deal. That much is obvious to anyone with a pulse. Less discernible, however, is what he plans to do about his fact-free disdain for this historic diplomatic achievement. To date, much attention has understandably focused on whether or not Trump will renew sanctions waivers. Some reporting suggests he will, albeit with the inclusion of poison pills. A clean renewal of waivers is an indisputable US obligation under the terms of the deal, and refusing to fulfill it may torpedo the agreement. However, against the backdrop of recent protests in Iran, this binary focus overlooks a third, more insidious path the Trump administration may pursue. 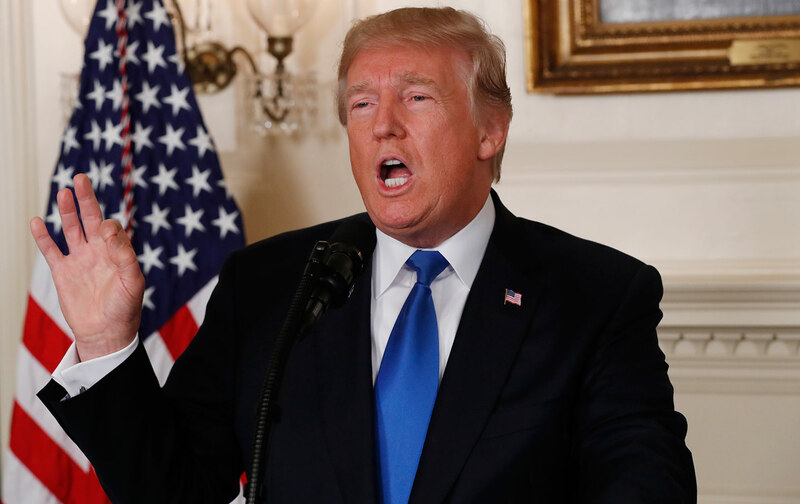 To understand the third path, we must first contextualize it: From the outset of his presidency, Trump has been flagrantly violating the Iran deal. Assertions to the contrary are less than honest. In addition to a year’s worth of public statements making clear Washington’s uncertain commitment to the agreement, three blatant examples of US violations stand out. At the NATO summit in May, Trump tried to persuade European countries to stop making trade and business deals with Iran. Two months later, he was reported to have urged G-20 nations to end commercial ties with Tehran. Combined, these constitute violations of Paragraphs 26, 27, 28, 29, and 33 of the deal. To hear senior Western diplomats tell it, the Trump administration has not approved a single Iran-related OFAC (Office of Foreign Assets Control) license since taking office—including for aviation giants Boeing and Airbus, which were practically written into Annex II, Section Five of the nuclear deal. As shambolic as the Trump administration has been during its first year in office, it defies plausibility to describe their Iran-deal violations as anything other than insidious and intentional. This brings us to today and the aforementioned third path on sanctions waivers. Before the recent protests in Iran, multiple Western diplomats had told me that waiver renewal was a long shot. Now they tell me that a growing number of Trump’s advisers see the protests as a sign that their sabotage of Iran’s investment flows is working. Thus, rather than killing the wavers, they are pushing to use Iranian protesters as leverage to continue creating uncertainty regarding America’s commitment to the deal, thereby increasing hesitation among Iran’s potential trading partners. Using the legitimate plight of Iranian protesters for unrelated geopolitical ends demonstrates repugnant insincerity—particularly when leaked internal documents show senior Trump administration officials proudly admitting that they use human rights as a club against adversaries like Iran, while giving a pass to repressive partners like Saudi Arabia. Trump’s team is not fooling anyone: They are trying to kill the nuclear deal, but in a way that will allow them to evade blame. With most attention currently focused on protests inside Iran, the White House will likely continue working overtime to deter foreign investment by creating perpetual uncertainty around the deal while simultaneously reissuing core sanctions waivers. Their goal is as simple as it is nefarious: Make the deal so unattractive to the Iranian government that it chooses to walk away from it, which would allow Washington to blame Tehran, even though it’s Washington that is actively collapsing the agreement. So far, there has been zero accountability for Trump’s repeated violations. To hear one senior European official tell it, “Trump keeps poking and prodding Tehran to do something stupid, but the Iranians are too smart to fall for it.” The Europeans, the Russians, and the Chinese should take concrete steps to stop this madness and do whatever they can to ensure that America both stays in the deal and fulfills all of its obligations. If they don’t push back against Trump’s efforts to sabotage the agreement, they will continue to get pushed around as the deal dies from a million paper cuts rather than a shotgun wound. At a time when Iranian citizens are demanding political, social, and economic dignity, the Trump administration is actively taking steps to worsen their lot. Barack Obama has been raked over the coals for allegedly not supporting Iranian protesters in 2009, but two weeks after the most recent protests began, Trump’s ostensible “support” has not made any positive difference for Iranians. Indeed, his compulsion to reverse Obama’s Iran policy remains without merit, and disregards both American interests and those of the Iranian people. If this sounds like Donald Trump’s Iran policy is awful, that’s because it is. Reza MarashiReza Marashi is director of research at the National Iranian American Council. He previously served in the Office of Iranian Affairs at the US State Department.